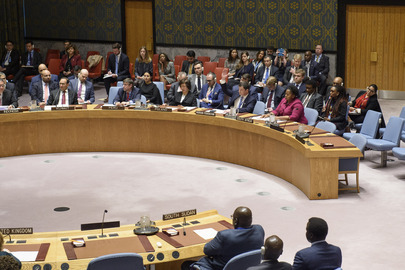 The Security Council today adopted Resolution 2459 (2019), extended the mandate of the United Nations Mission in South Sudan until 15 March 2020. The Council decided to maintain overall force levels, including the presence of a Regional Protection Force. The vote was 14 in favour, with 1 abstention (Russian Federation). Dmitry Polyanskiy, Deputy Permanent Representative of the Russian Federation to the UN, signals his country's abstention.